Bali has a variety of tourist products and attractions that are very interesting. One of the tourism products offered by tour operators in Bali is bicycle tours in Sanur Beach Area. Consumer behavior is a process that is closely related to the buying process. This study aims to analyze the psychological factors of foreign tourists on bicycle tours in the Sanur Beach area of ??Bali. These psychological factors are divided into three factors, namely motivation factors, perception factors and attitude factors. Respondents used were foreign tourists who were on a bicycle trip on Sanur Beach. Total respondents were 120 people determined by non purposive sampling technique. Data analysis used quantitative descriptive analysis techniques with Likert scale and data processing through validity, reliability and factor analysis tests supported by SPSS version 17.0 for Windows. The results show that the psychological factors of tourists in bicycle tours consist of three factors, namely motivation factors, perception factors and attitude factors. And each factor has an indicator. Based on factor analysis, it was found that there were two psychological factors that influenced the decision of foreign tourists on bicycle tours in Sanur Beach with a loading factor of 60,127%. The first factor was named the previous experience factor with a value of 7.215 and the second factor was named the family encouragement factor with a value of 1,063 based on these two factors, the dominant factor is the previous experience factor with an eigenvalue of 7,215 and has a variance percentage value of 60,127% with these results it is advisable for bike rental parties in Sanur Beach to pay more attention to bicycle rental prices to foreign tourists. Anonim, 2009. Undang-Undang Republik Indonesia Nomor 10 Tahun 2009 Tentang Kepariwisataan. Danarjati dkk. 2013. Pengantar Psikologi Umum. Yogyakarta: Graha Ilmu. Davidoff, Linda. L terjemahan Mari Juniati. 1988. Psikologi Suatu Pengantar. Jakarta:Erlangga. Departement of Health Government of South Australia., 2002. Population Research and Outcome Studies. Dillon, S., Irvine, N., Palmer, C., & Widing, K. (2001). Cycling France. Oakland: Lonely Planet Publications. James F. Engel (1994), pengertian perilaku konsumen, dalam buku Perilaku Konsumen, Edisi 6 : jilid 1. Penerbit Binarupa Aksara. Page, S. dan Lumsdon L. (2004). Tourism and Transport: Issues and Agenda for the New Millennium. Elsevier: Boston. Ritchie, J.R.B., Crouch G.I. (2005) The Competitive Destination: A Sustainable Tourism Perspective, CABI, Wallingford. Sangaji, Etta Mamang, Dan Sopiah.2014. Perilaku Konsumen (Yogyakarta, Andi Offset) Setiadi, Nugroho J.2003. Perilaku Konsumen. Kencana. Jakarta. Sukardi. 2004. Metodologi Penelitian Pendidikan: Kompetensi dan Praktiknya,. Jakarta: Bumi Aksara. Widiantono, Joni J. (2009). Green Transport: Upaya Mewujudkan Transportasi. WIDIASTRI, Ni Komang; SUWENA, I Ketut; LELI KUSUMA DEWI, Luh Gede. FAKTOR-FAKTOR PSIKOLOGIS WISATAWAN MANCANEGARA DALAM BERWISATA SEPEDA DI KAWASAN PANTAI SANUR BALI. 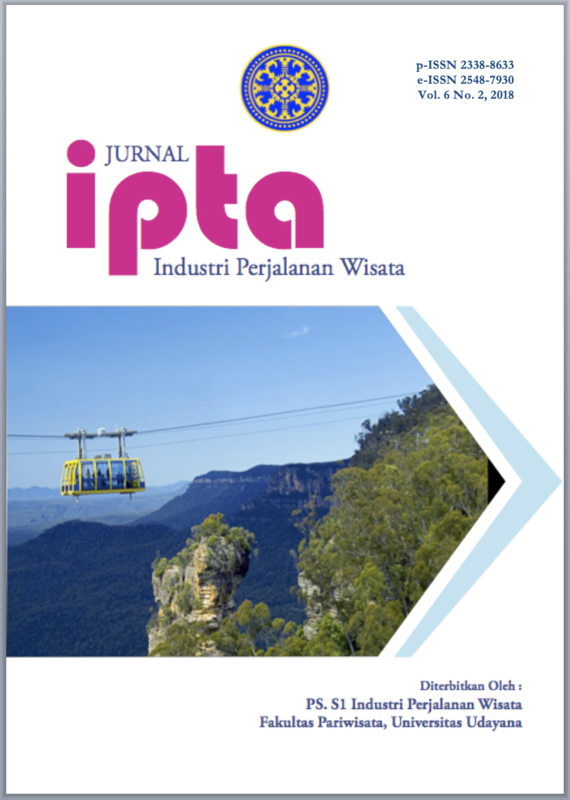 Jurnal IPTA, [S.l. ], v. 6, n. 2, p. 133-139, dec. 2018. ISSN 2548-7930. Available at: <https://ojs.unud.ac.id/index.php/pariwisata/article/view/45497>. Date accessed: 21 apr. 2019. doi: https://doi.org/10.24843/IPTA.2018.v06.i02.p07.